mistakes now mostly make sense. We also have tried out MCT Island this year, having gotten it used for a song. We enjoyed Grammar Island, which was mostly review for us of parts of speech, which we’ve covered many other times. But Sentence Island has turned into a slog midway through. The writing assignments, which we’re not even doing all of, are not fun for the kids at all and produce mostly stilted, awkward writing. We may give up on it. 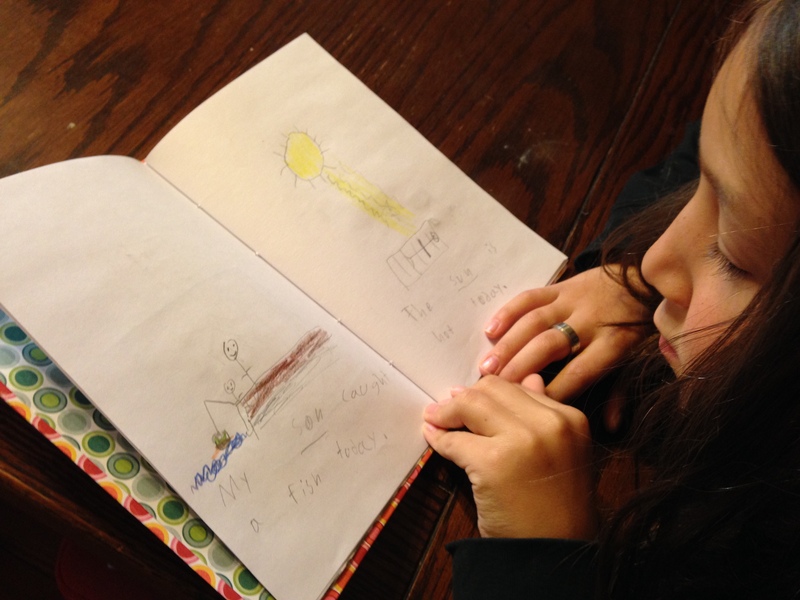 Brave Writer continues to be the heart of what we do for language arts. While we don’t get to it as often as I might like, poetry teas and movie nights continue at the Rowhouse. We freewrite in various ways most weeks. We use narrations for history and science. We also do dictation from whatever read aloud we’re working through. Every few weeks, though, I’ve been giving them a “break” from our read aloud dictation and letting them instead pick a passage from their chosen required reading book. They copy the passage then teach it to me as if I’m the student and they’re the teacher, making sure to ask good questions about the meaning of the passage and pointing out all the spelling, grammar and punctuation I, the student, will need to remember. 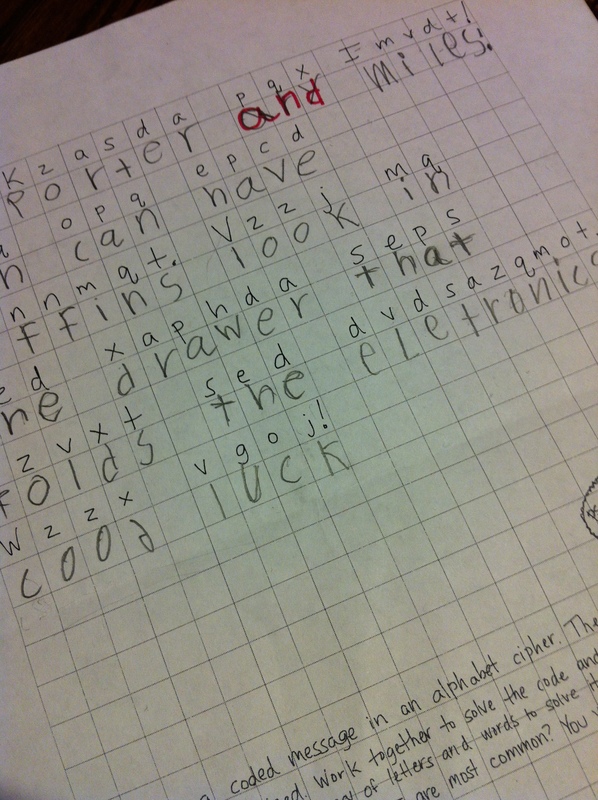 They then dictate it to me and correct my dictation (I always get a few things wrong for them to find). 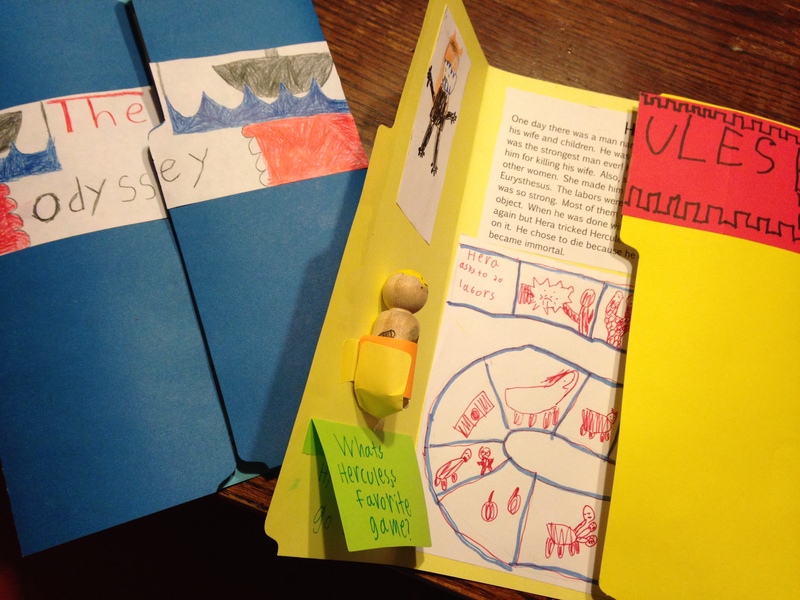 The kids’ lapbooks about The Odyssey and Hercules. Brave Writer’s Partnership Writing has continued to be fun. To go along with our preparation fro the National Mythology Exam, we did the Greek myth lapbook project. 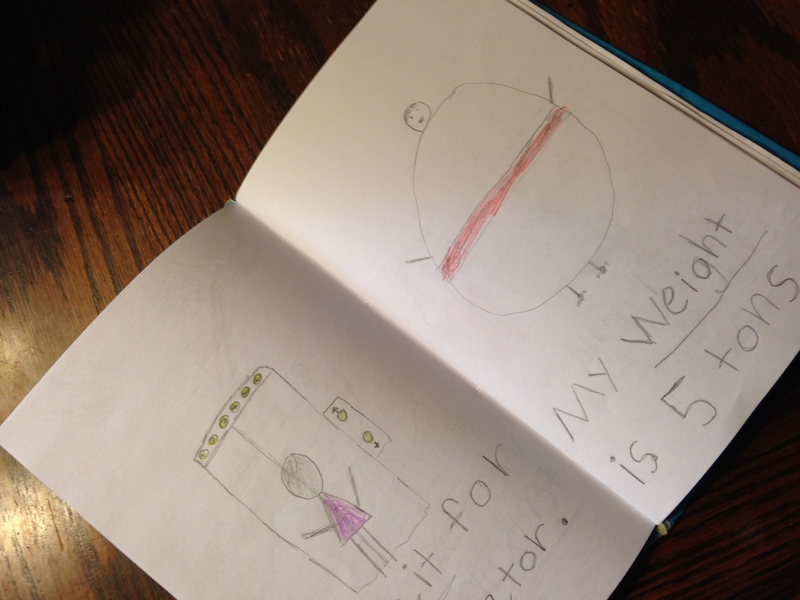 I’m still not swayed that lapbooks are particularly great (loyal blog readers will probably remember that lapbooks were on my list of homeschool things I really don’t get) but the kids did a decent job with them. Mushroom made a maze for Odysseus to go home through in his and BalletBoy made a fake “Twelve Labors” board game on his for Hercules. We’re going to tackle the imaginary continent or island chain in February and March. As always, it’s difficult not to be constantly second guessing about something like writing, but I see how they are getting more and more fluent. As I glanced back through the last several dictations we did, I saw full comp pages of writing with “Great Dictation!” and “Nearly perfect!” scrawled by me across the top. It feels very much like we’re moving forward and I can see how a couple of years from now, we will be ready to start tackling essays and and more purposefully organized writing. I know I said I’d stop posting every project we did with Brave Writer’s Partnership Writing, but they all just turn out so darn pretty. It’s hard not to. 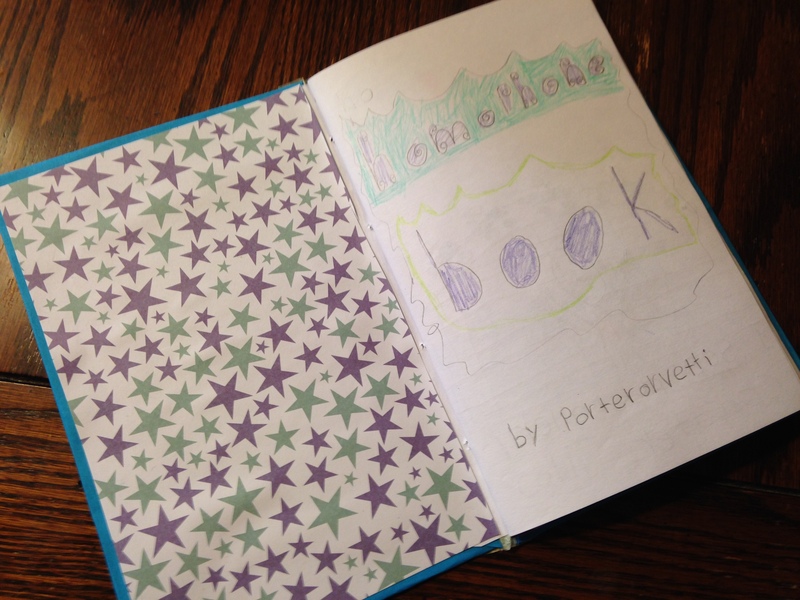 We just finished this month’s project, which was creating a book about homophones. They wrote sentences and drew pictures to show different homophones. This dovetailed well with All About Spelling, since Mushroom is still stuck at the end of Level 3, learning about homophones and BalletBoy’s Level 4 also highlights homophones in many of the steps. I let the kids mostly draw from their All About Spelling lists for these. We also read some very cute books with homophones, such as the classics Amelia Bedelia and The King Who Rained. I know these are usually read by younger children, but the jokes were much funnier now to my kids than they ever were when they were younger. The best homophones book we looked at was Dear Deer by Joe Baretta, which featured an amusing set of animal themed homophones on every page. Again, it was clearly meant for young kids, but both boys thought it was funny, especially since they were planning their own silly homophone illustrations. We made our own books for this project as well. I have some experience with making books, so we made up our own way, however, this set of instructions from Artists Helping Children is pretty similar to what we did and they have some other great book projects. I have learned from years of book making with kids that cardboard often makes for a far too thick book (not to mention it’s harder to work with), so we used lightweight cardboard (specifically an old department store shirt box) instead for the cover. It comes out more like a paperback that way. If you’re interested in making books with kids and the above isn’t enough, Making Books that Fly, Fold, Wrap, Hide, Pop-Up, Twist, and Turn by Gwen Diehn is by far my favorite. Also, this website is also really sweet and fun. The results were really polished looking. Overall, this was a pretty painless project and relatively quick. With just a few pointers and direction, they actually did the finding homophones and then the writing for this one mostly on their own, plus the design for the pages totally on their own. I did go over the sentences they wrote and corrected spelling, but otherwise, I left them alone. They chose to write simple sentences, but that was fine. There was a lot less partnership in this project. I’m not sure if that’s them maturing as writing or the ease of the project (mostly the latter, I suspect), but it was really neat to see what they made. I especially loved seeing Mushroom’s art for it, which was really well done and showed a great sense of space and perspective. I know I keep posting about Brave Writer’s Partnership Writing, but it has been so much fun and such a good purchase. 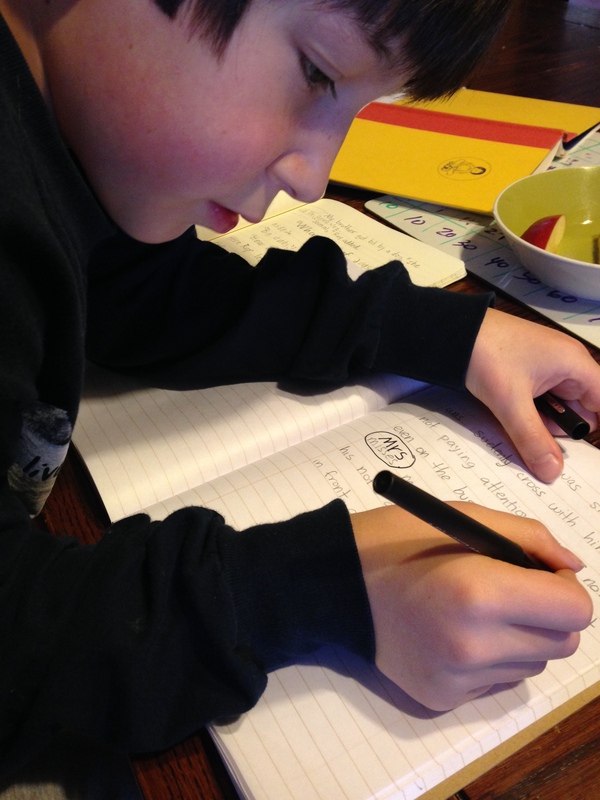 If anyone out there is new to Brave Writer or got The Writer’s Jungle and has no idea what to do next, it’s a really practical set of projects for kids who can write a little, but aren’t yet able to just sit down and churn out something without help. 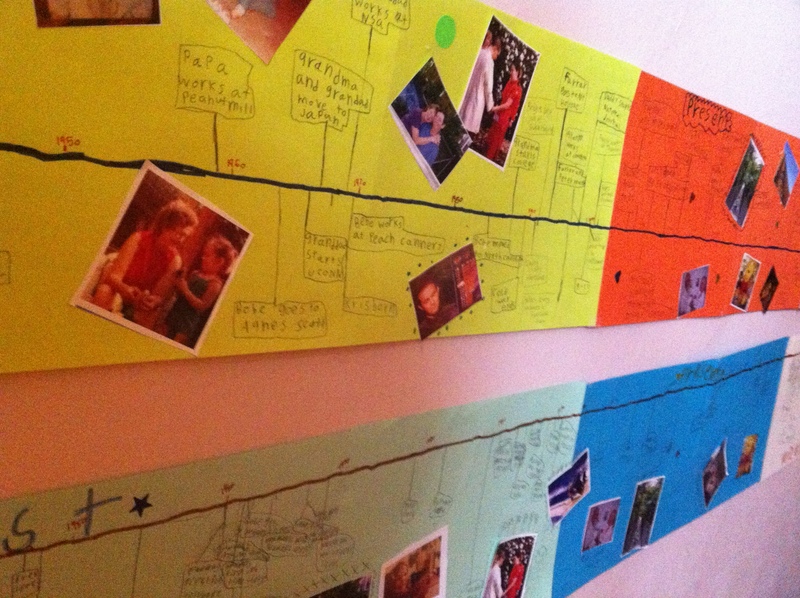 We tackled the second project, making a personal timeline, and it ended up taking a month and then some. That’s because from the first moment that I introduced the project, the kids had their own ideas about what sort of things they would ask the grandparents and put on their timeline. First, the kids brainstormed and wrote down interview questions, which I typed up for them. I suggested that they interview the Husband and me and perhaps a grandparent or two, but they insisted on doing all five grandparents as well as one of the great-grandparents. Not only that, but the questions they had were unexpected, like, “What was the worst job you ever had?” and “What was your scariest moment?” Not exactly timeline of life events material. However, the kids pushed through even though it took quite awhile and a lot of slow note taking. It was very special to see them interview all those people. When they interviewed their great-grandmother, they discovered that her “best” job was almost the same job that was their grandfather’s “worst.” It was a job they both had as teens in a local peanut factory. Even if much of the information wasn’t timeline type stuff, it was really cool to see them ask good questions and hear family stories. Next, we chose pictures and picked which events would actually end up on the timeline. I made post-it notes with the events and let the kids arrange them, then write them in. We had to do some math to figure out the scale for the timeline. 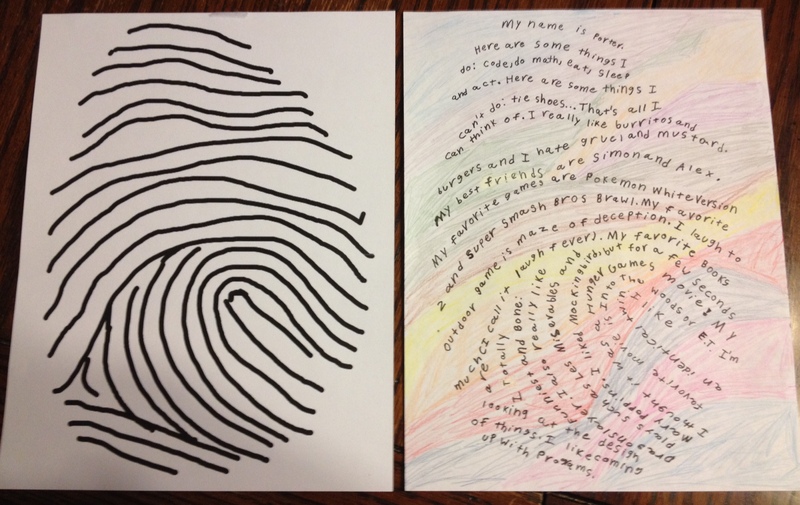 It ended up in three sections with three different colors of paper for each one: before I was born (the past), my life (the present), and what I might do in the rest of my life (the future). It was fascinating to see what sort of things the kids think their future holds. Both of them put appearing on Jeopardy! as a future life event. Mushroom planned to be a movie star, but later in life, perhaps like his father, who only started acting recently. BalletBoy had his future very mapped out, but couldn’t come up with anything after age 30 except that he plans to die at age 89. BalletBoy cracked me up many times during this project. At one point, he told a stuck Mushroom, “You can put anything for the future, even something like invent a time machine. Ooh! I’m putting that on mine!” At age 30, BalletBoy plans to invent his time machine. Later, as he pasted on photos he asked me if he could include photos of himself making the timeline, just to keep it really up to date. So yet another Partnership Writing project didn’t go quite as scripted, but was a blast to do and I’m thrilled with the results. 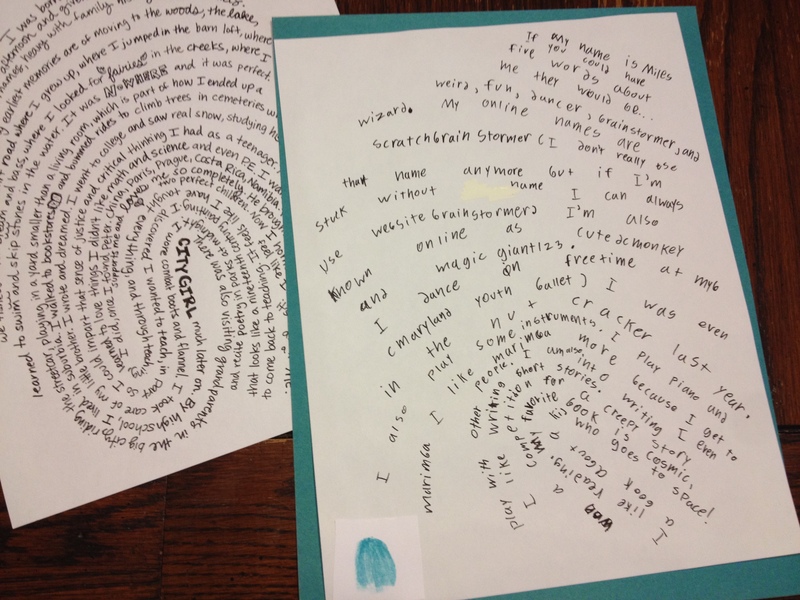 There was a huge amount of writing for the kids with this project. They wrote questions, their own life events, their future life events, notes for all eight of the interviews they did, and then finally wrote on the final timeline and titled it. It was an impressive amount of work. When we come back from break and start fourth grade at the end of September, I’ll be glad to have what looks like a much lower key project with the Homonyms mini-book next. Okay, I promise, my last gushing review of Brave Writer’s new Partnership Writing, but we really did have such fun doing the first project about secret codes. I checked out several secret code books from the library. For the most part, they were all the same, just from different eras and with slight variations. We found Top Secret: A Handbook of Codes, Ciphers and Secret Writing by Paul B. Janeczko to be the most useful. I liked that there were anecdotes from history about secret codes, several of which we read aloud. We also found some good extensions for the project in here for once we finished all the suggested avenues in Partnership Writing. We did two that I thought were worth sharing. First, I left the kids a message in cipher for them to find in the morning, along with several clues on how to solve it. It told them where to find special strawberry muffins. Since this was basically a cryptoquote, I left the book open to a page with this information about the most common letters, short words, double letters and so forth in English. It took them a long time, but they did decipher it. I was really proud of their persistence. And while it was a tough activity and not for every kid at this stage of writing, I thought it involved a lot of good language thinking. Enough that we might try it again with another baked good and a new hiding place at some point. Next, after doing a book cipher that was suggested in Partnership Writing, we took it to another level by writing the plain text ourselves. Mushroom and BalletBoy each came up with a message to hide in a letter. They wrote the letters and scattered the words for the secret message inside them. 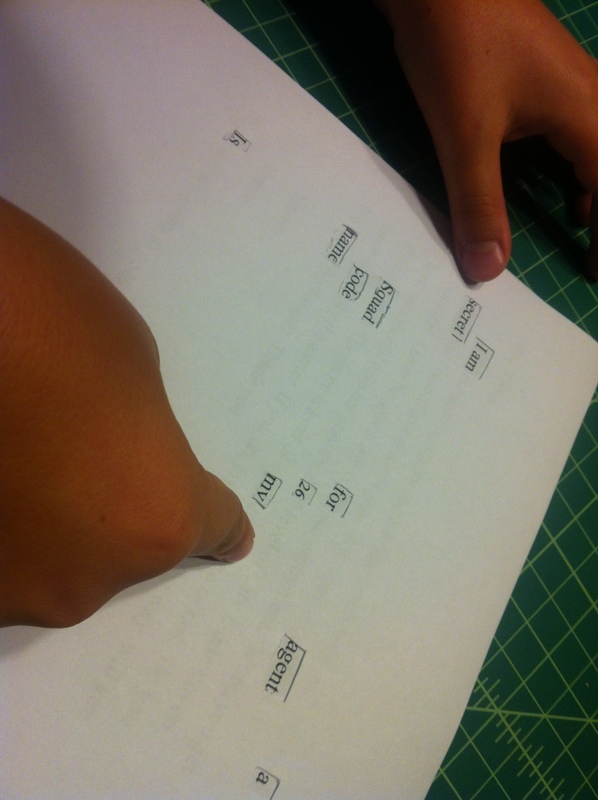 I helped them edit for spelling, then we typed them up. 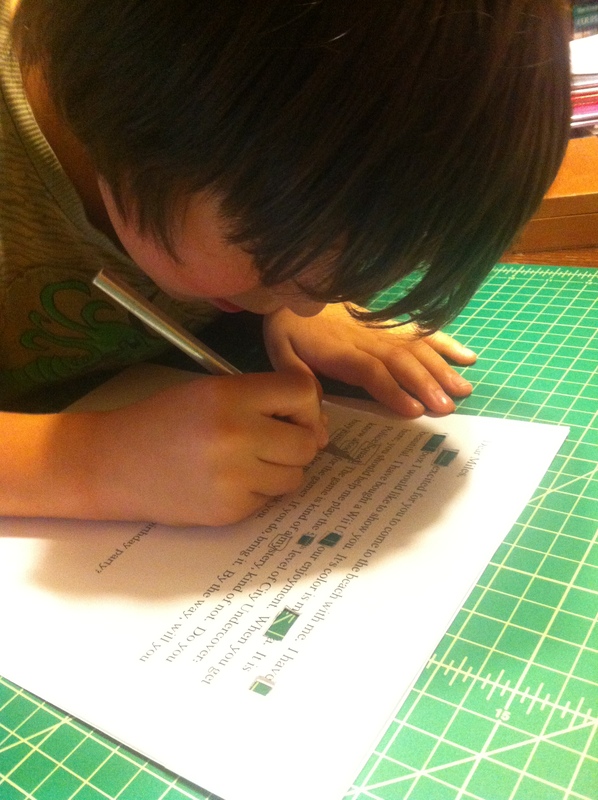 Then, they carefully cut out a special key for reading the letter. When you lay the key on top of the letter, it reveals the secret message with carefully cut out holes. To create the key, I printed two copies of the letter in a nice, large type. The first one was set aside. The second one was taped to a sheet of blank paper that would become the key. We used an x-acto knife to cut out the words of the message from the letter. When we separated the letter copy from the blank paper, the blank paper became the key and the cut up letter went to the recycle bin. We never do anything quite the way it’s proscribed, so we didn’t follow the routine in Partnership Writing to the letter. However, we had a blast. We’ll take a week or so off and just continue our routine of dictations, poetry teas, narrations, and reading then dive into the next project. If you happen to hang out with me online, you may know that there are certain things for which I am a complete homeschool evangelist. Products that I think everyone should try and love. Of course, no resource is right for everyone and so on and so forth. And there are many things that we use that I find very helpful and solid. But here are the things that I just love, the things I like to gush over. I know I sound hyperbolic, but I firmly believe that these are the best science activity books for children ever written. They focus mostly on physics and are good for upper elementary and middle school. Where many science experiment books lay out a proscribed set of steps and a predicted outcome, these books show you how to build equipment to let you actually play with concepts and test out and explore the science on your own. We dabbled with them back in first grade, doing a few activities out of several of them. Part of me can’t wait for fifth grade when we get back to physics so we can use them again. Yes, you all know, I’m a Brave Writer devotee. When I first heard Julie Bogart speak, it was like a revelation. 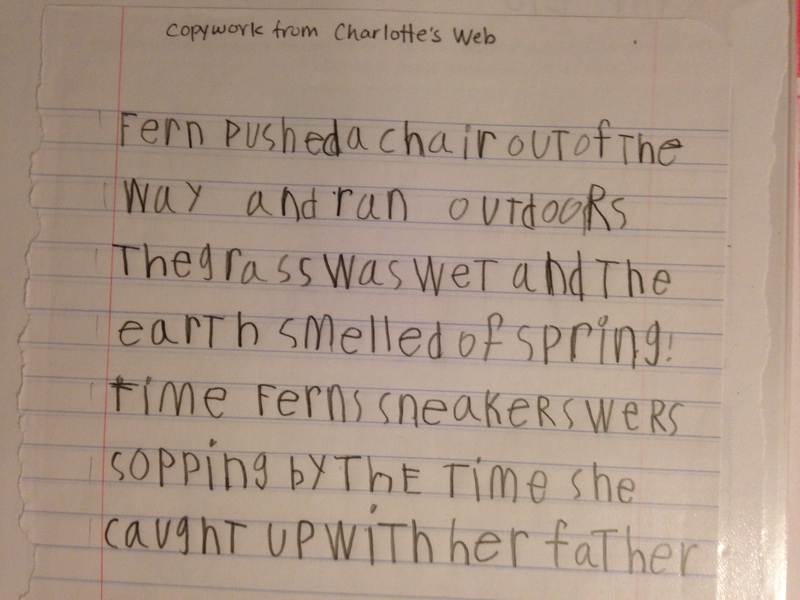 She reminded me of all the things I had learned about teaching writing when I was a school teacher, but she had somehow made it add up with the things I was learning about teaching younger children, particularly about the value of copywork and other old-fashioned writing teaching methods. 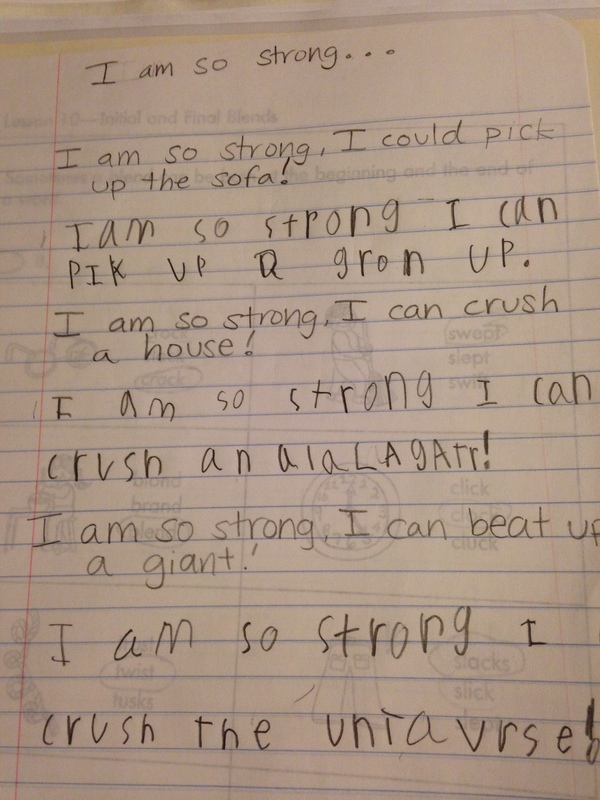 To me, Brave Writer is the most positive and flexible approach to writing I’ve seen. These workbooks are so much fun and so whimsical that I fell in love with them the moment I saw them. They do for logic and writing what the Anti-Coloring Book series does for coloring books. They’re like anti-worksheets. We’re especially big fans of Wakeruppers, but I have a few things from them and look forward to getting more. Nothing I’ve gotten has been a dud. We started slow with Miquon, just trying out some of the Orange Book, but not really finding it fit us. However, when Mushroom became math anxious at the end of first grade, we had to throw out all the math curriculum we had been using. Eventually, we went back to Miquon, finishing the Red Book, then the Blue, Green, and Yellow volumes as well. I learned to really use the Annotations and to refer to Rosie’s videos at Education Unboxed when I needed some inspiration. To me, Miquon is the most flexible, in depth, deep thinking math program there is out there. I thoroughly love it. I have delayed us finishing Purple by bringing it down to just a very little bit every day, but it will be at an end before the school year is through. If only there was a Miquon Mauve and a Miquon Black and a Miquon Navy! Those are my homeschool obsessions. What are yours?